I love bread. Who doesn’t? Especially homemade bread. The small fills the house. Warm from the oven, smothered with butter. Yum. But THE debate is (of course) white versus wheat. I prefer white bread. (I highly recommend you try my “Perfect Traditional Homemade White Bread”). For years my husband has been asking for wheat bread he could use for sandwiches. I made some great wheat bread…but you had to slice it thick. But after everything I’ve learned the last year, I finally have perfect homemade wheat bread that can be used for sandwiches. 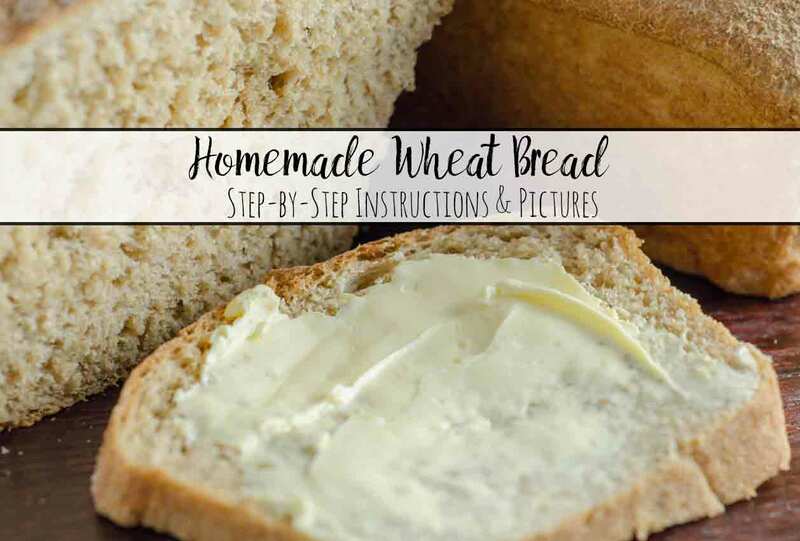 Curious, though…do you prefer white or wheat? 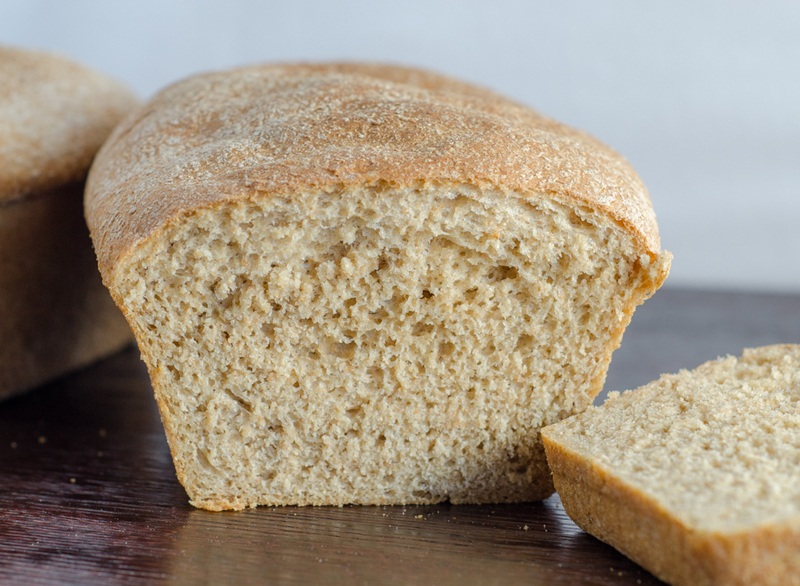 What’s the secret to perfect wheat bread? The primary one is the flour, which probably isn’t a surprise. The second is how sugar and sweetness are added to the mix. The final one is probably less of a secret and more an important thing to know: your dough is going to be sticky! This post is part of my “Stop Buying, Start Making” series. The “spirit” of the series can be summed up in this post: it’s cheaper to make your own, it tastes SO MUCH BETTER, and it’s healthier. Ingredients are below in the printable recipe. 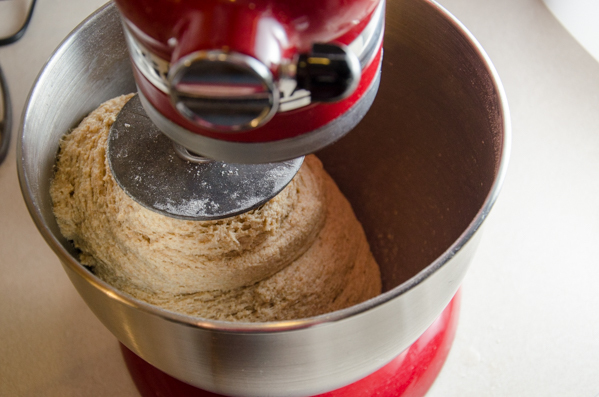 Sometimes I use “white whole wheat flour” (Yes, you must use that if you’re using store-bought. Plain wheat flour will have a much different taste ). Sometimes I grind my own grain. Yes, really. When grinding my own, I try to do a half and half of soft and hard wheat. The soft wheat is sometimes hard to find, though (no pun intended). 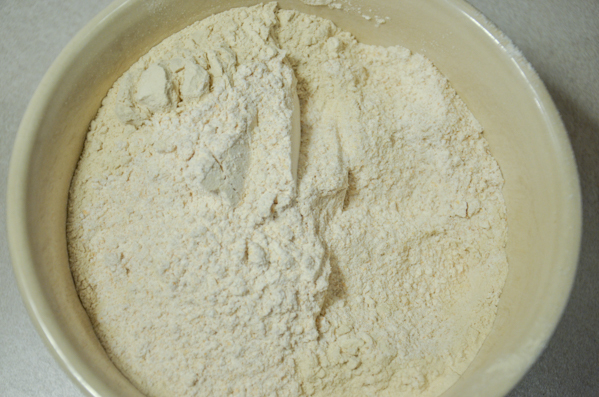 Portion of flour and gluten, mixed. Add brown sugar, honey, shortening mixture. 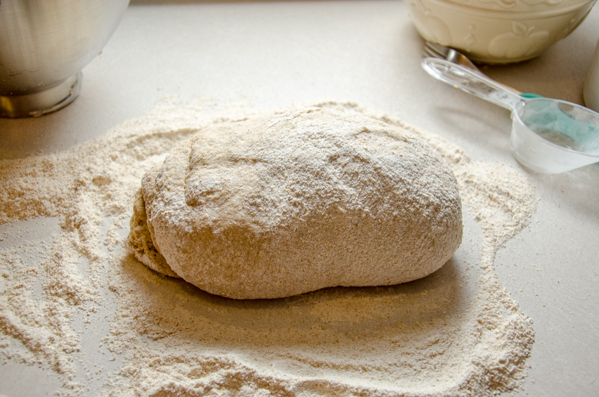 How it looks when adding last bit of flour before 2 minutes of kneading. Fresh out of the mixer. Knead 2-3 times just to make sure consistency is good. After first rise. Next, we'll punch down! 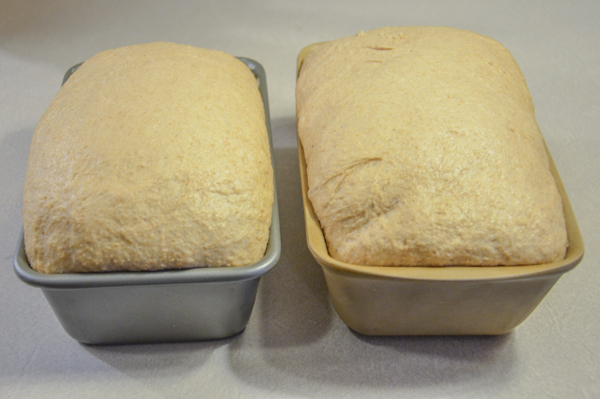 Divide dough into two and then form into loaves. Formed and ready to start second rise. After second rise, ready to go into hot oven. Mise en place. 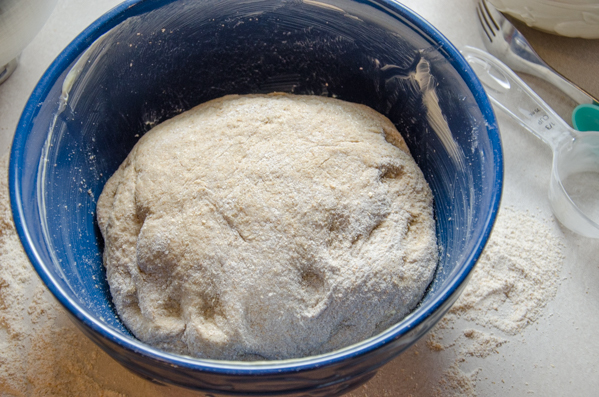 In a medium bowl, mix 3 & 1/2 C. of the flour and the gluten together. On medium-low heat, heat 1/2 C. water. Dissolve brown sugar into water. Add shortening and butter, stir to melt. Mix in honey. Do NOT overheat. Remove from heat and all to cool until just warm (or down to room temperature). 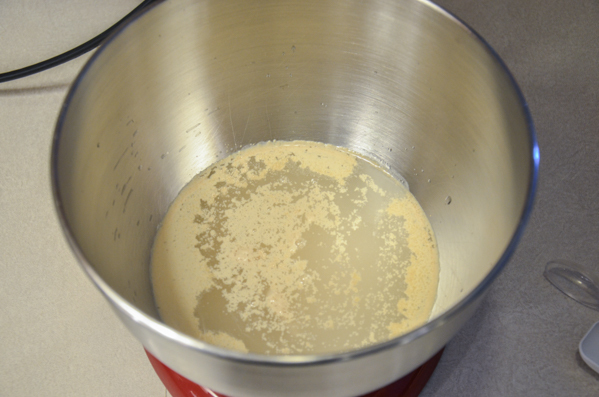 In stand mixer, dissolve yeast in 2 C. hot water. Add white sugar, salt, & flour/gluten mixture. Mix well. 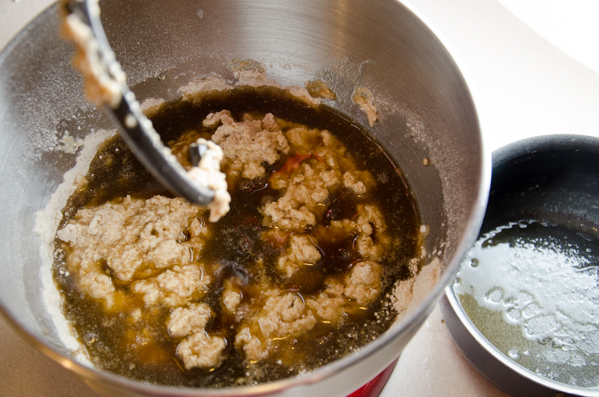 Mix in water/brown sugar mixture. Mix in rest of flour (you might not use it all) 1/2 C. at time until mix clings to hook and cleans side of bowl. Knead on speed 2 for 2 min. 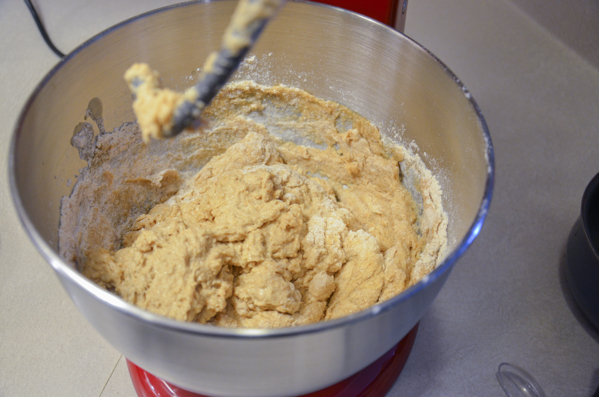 Add flour a tablespoon at a time if dough “falls off” hook completely. 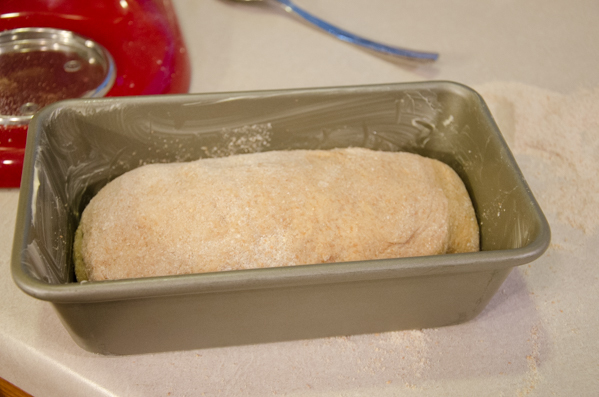 Add no more than 1/2 C. total & keep in mind wheat bread will still be slightly “sticky,” unlike white bread. 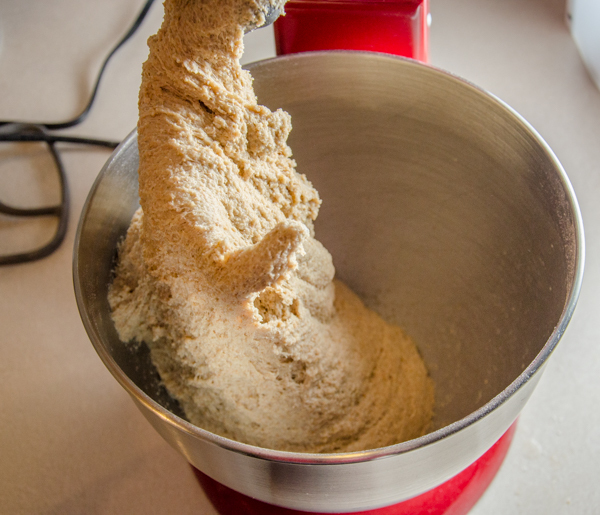 Remove from bowl and place on lightly floured surface. Knead 3-10 times, form into round. Place in a large, well-greased bowl. Turn over to grease top. Punch down. 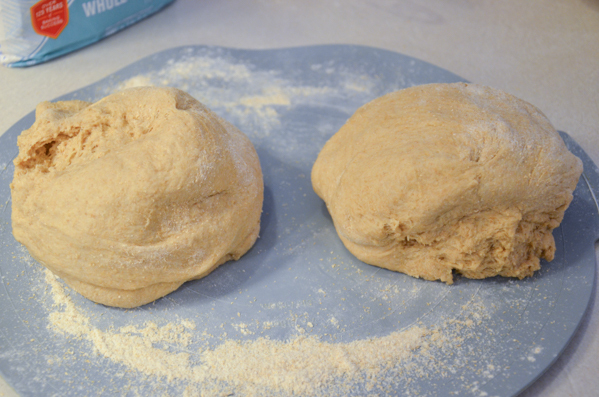 Divide dough into two equal parts. Knead once or twice and shape into loafs. Place in greased bread pan, turning over to grease top. 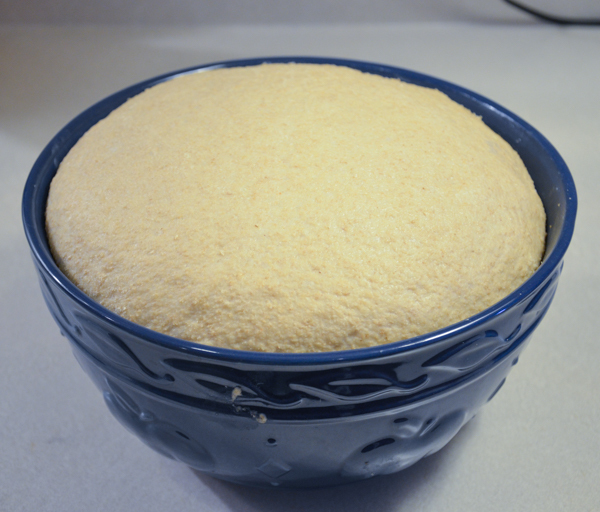 Allow to rise until dough doubles in bulk. Bake at 350° for 35 min. If needed, cover with foil after 15 min. to prevent over-browning. Remove from oven. Let sit in pan 5 minutes, then flip out onto rack to cool. Final trick: for it to be perfect for cutting for sandwiches, let it stand for at least one day. Yes, seriously. I cut off the end and stick it in a Ziploc (it won’t fit with the end on there…plus I have to taste test…haha). Let it sit at least 24 hours. Now, it’s perfect for slicing!